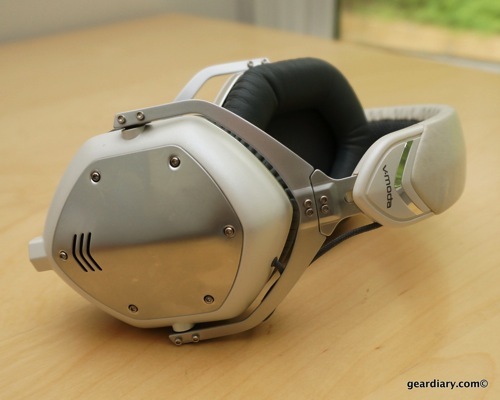 At $310, the V-MODA Crossfade M-100 headphones are a pricey option for anyone looking to purchase a new pair of over-the-ear headphones, but they are absolutely worth the price of admission. 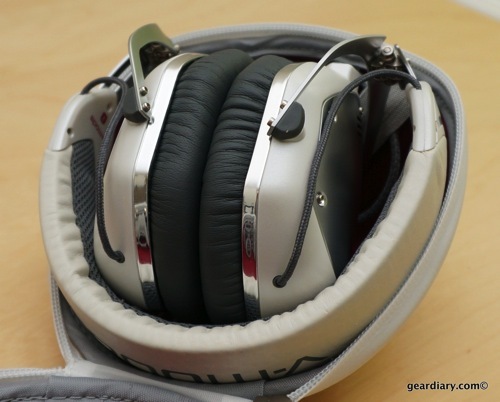 The headphones are tough, comfortable, block outside noise, and they sound amazing. They ship with a super-protective case, multiple cables and more. Check them out. 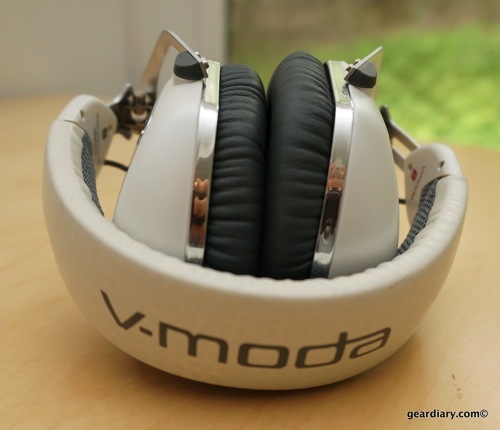 V-MODA’s latest headphones stand out in almost every regard. While the company name and these Crossfade M-110s might not be as familiar as Beats or Monster or either company’s offerings, these headphones have all the style, flexibility and audio-quality you could want. Are they worth their north-of-$300 price? The short answer is, “Yes”. 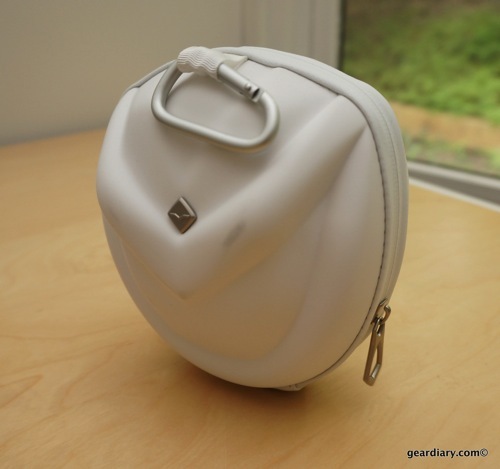 The company includes an exceptionally compact and highly protective “Portable Exoskeleton Case”, which is just a cute way of simply saying, “case”. 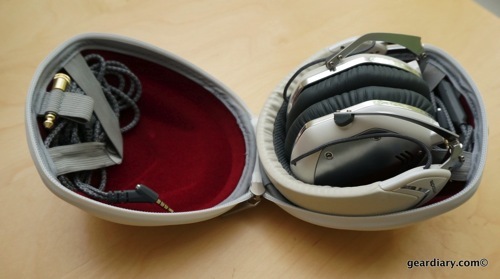 The diminutive footprint of the case makes clear just how small the headphones are when they are folded up. The case is tough and offers a great amount of protection for the headphones; that’s a good thing since these are pricey. My biggest issue with the case is that, with these white headphones there is a huge potential for them to get dirty… and fast. Just look at what has already happened and I’ve barely used the case on the go. The company is so confident in these headphones that they decided to offer an amazing warranty with them. They will insure the headphones for a full two years. After that they will offer their “Immortal Life” Plan that will let you purchase a new pair for 50% of the current price. That’s pretty impressive, and it adds significant value to the $310 price of the M-100s. Inside the case you will find the “V-STRAP System” that lets you organize the included cables and 1/4″ adapter. It does a nice job of keeping the cables from falling out when you open it up. And even when the headphones, cables, and adapter are in the case, there is extra room for a USB Flash Drive and Fader earplugs. The cables themselves deserve a bit of focus since they represent the same attention to detail you find in the headphones themselves. The “SpeakEasy Mic Cable” is specifically designed for use with voice recognition or for making calls in noisy environments. The inline button control is universal and works with works with all 3.5mm smartphones and tablets. That means it doesn’t matter if you use a product from Apple, Google, Microsoft, Amazon or Blackberry. The cable and control button will work with them all. 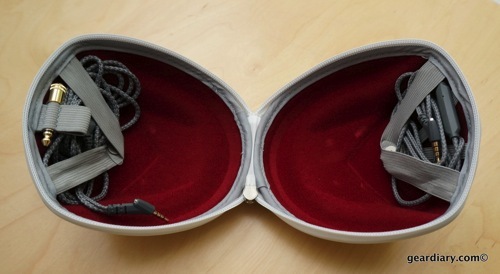 The “SharePlay Audio Cable” makes sharing your music as simple as plugging in another pair of headphones. If you need to do more you can purchase the V-Moda BoomPro, CoilPro or 3-Button Cables. They let you use the headphones for Skype, gaming, DJaying and more. As mentioned previously, the headphones have a “CliqFold Hinge”. 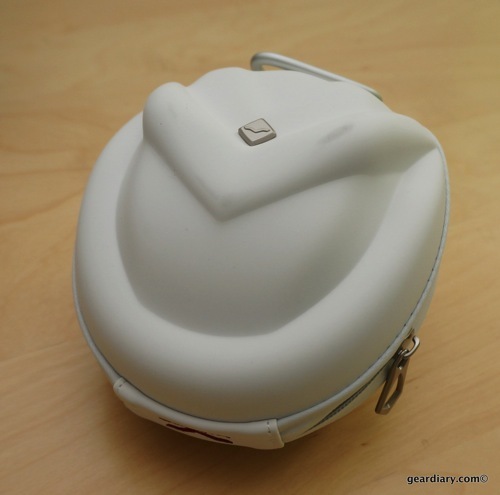 This tough little hinge design lets the headphones fold up and become a small, compact unit. They open with a solid, and satisfying click. The 3.5mm dual inputs, one on each ear cup let you mix two audio sources at the same time. Or, if you are in a sociable mood you can daisy chain the headphones and let a friend listen along with you. 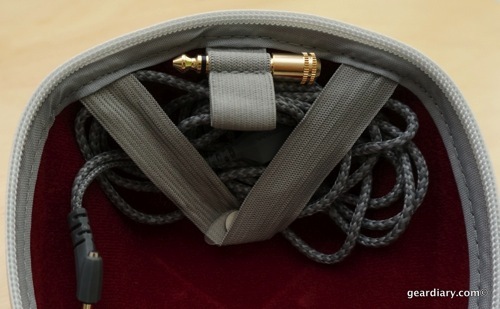 V-MODA even includes V-CORK seals that protect the unused input on the headphones. All of this results in a pair of headphones that are outstanding in pretty much every regard. They are comfortable, solid, and they sound … awesome! 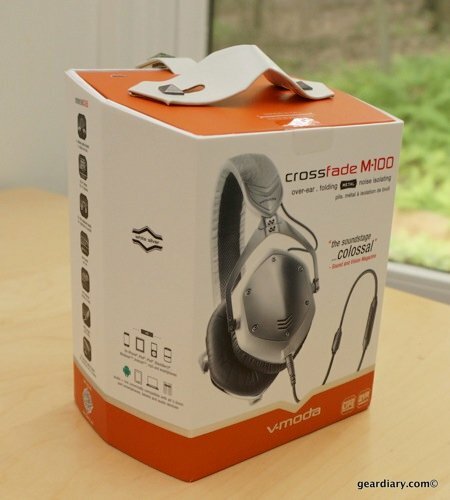 Out of the box the Crossfade M-100s sounded good. After using them for a while, they sounded better and better. Now I’m not totally sure if this was the result of the headphones “burning in” or my just getting used to their particular sound and fit. Honestly it doesn’t matter to me why they sounded better and better the more I used them. All that matters to me is that I liked them initially, and I truly love using the headphones now. They offer plenty of bass, but it doesn’t hit you over the head, and it certainly doesn’t sound like the signal was overly processed to create the bass. They simply sound awesome and let me hear the detail in the music regardless of the genre. 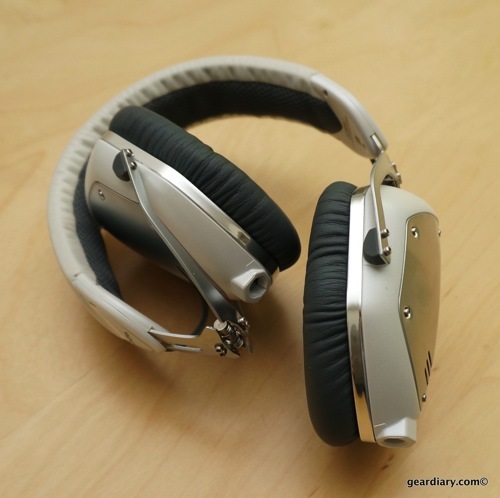 Details came through the music that are often lacking with other headphones. 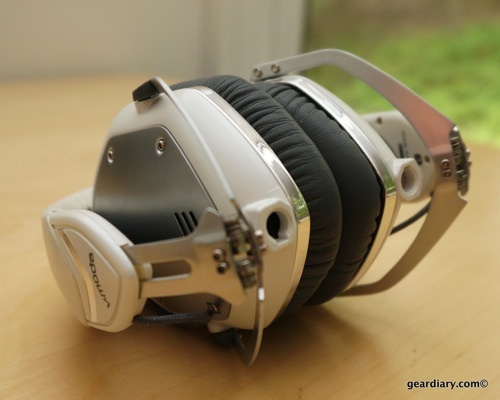 Add in the fact that the M-100s are super comfortable and I was, and am, blown away. My only complaint is the fact that, after using them for an extended period of time they did cause my ears to get a little hot. That’s simply the result of the pleather ear cups creating a good seal, and it is remedied by simply lifting them off the ears for a few seconds. 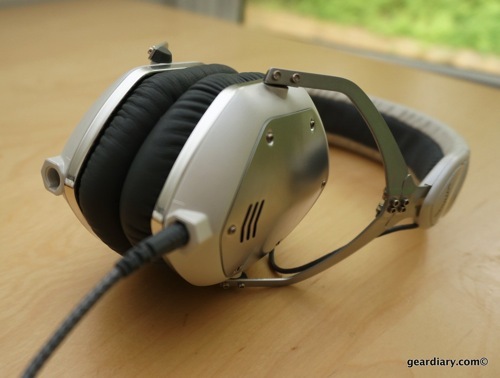 The bottom line here is this: If you are in the market for a quality pair of over-the-ear headphones, don’t need active noise cancellation, and are willing to spend north of $300, then you need to check out the V-MODA M-100 headphones. My bet is that so long as you don’t need to have the look of Monster or Beats’ offerings, you’ll have a hard time not choosing these. Learn more here.